Peter Taylor at work in the Alice Plaza. 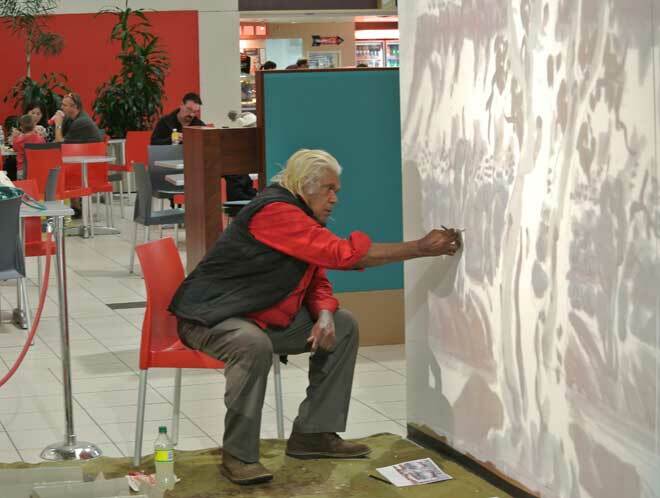 A mural in the Namatjira tradition will soon grace a wall inside the Alice Plaza and is bound to become a drawcard for art lovers and tourists. Work began yesterday with Ngurratjuta Many Hands artists Peter Taylor and Mervyn Rubuntja outlining the scaled-up forms of a landscape painted by Taylor. They are likely to start painting today, with other Many Hands painters joining in. Watercolours are not an option of course. A watery, light acrylic paint has been chosen and the wall prepared with an off-white ground close to the colour of watercolour paper. 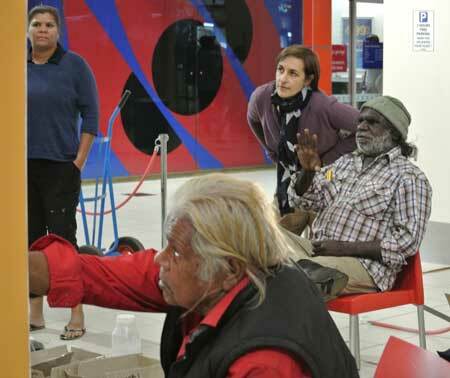 “The aim is for it to look as much like a watercolour as possible,” says Brigida Stewart, visual art lecturer with Batchelor Institute, who is guiding the artistic process in this project partnership between Batchelor and Ngurratjuta Many Hands. “It’s going to be fun,” says the easy-going Taylor about the prospect of other artists working with him on his composition. His work is known for its distinctive use of white highlights across the landscape, giving an impression of a dazzling world lit from inside and out. The scene he has depicted for the mural shows the range east of Heavitree Gap (Ntaripe) with the Todd River (Lhere Mparntwe) flowing through it and a fine old gum rising in the foreground. 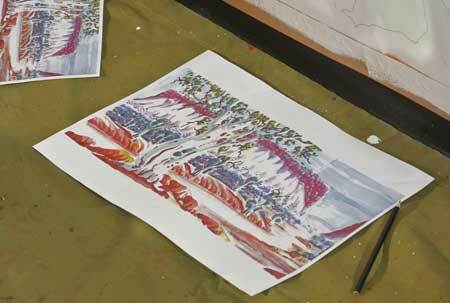 Rubuntja, like his father W. Rubuntja, paints in both the watercolour landscape and the acrylic (dot) traditions. He and Taylor recently went on an artist exchange visit to China. How was that? At right: Mervyn Rubuntja talking to Brigida Stewart about the next step. Art worker Marisa Maher at left, Peter Taylor in the foreground. Even when they went into the countryside, they could look back and still see the city on the horizon. But the experience has whetted his appetite. He hopes they’ll make another trip in the future, perhaps to England. He mentions some of the other greats, like Clifford Possum, who have done so. On current plans, the mural will be completed by August 6. It’s possible to watch the artists as they work, at the base of the lift well in the centre of the Plaza. They expect to be there from Mondays to Thursdays. I also am an Artist on Magnetic Island, having lived in Alice for 22 years and being a good friend of Wenten. What a great project they are doing would love to see it in progress, I have plans for returning, may be one day I will see the finished work. Good luck to the Artist. How great this will be to sit and eat or have a cuppa and look at a great landscape painting. Excellent and congratulations to the Plaza for allowing this to happen. Can’t wait to see the end result.